What is AdventureNEXT Near East? AdventureNEXT helps put emerging destinations on the adventure map. Countries or regions that want to position themselves as attractive for their natural or cultural resources or unique activities may host an AdventureNEXT, which will offer local suppliers the chance to present themselves to international buyers and media through a large Tour Operator MARKETPLACE and also by hosting adventure FAM trips. AdventureNEXT also has keynote speakers and workshops designed especially for regional issues and delegates looking to professionalize and expand their adventure product offerings. Check out our Events page to view videos and reports from last year’s AdventureNEXT Near East. *Approved fully hosted delegates are provided with complimentary registration, hosted airfare, lodging, airport transfers, and a Pre-Adventure. MARKETPLACE Table – MARKETPLACE is incorporated into the event agenda; sign-ups are on a first-come first-serve basis. Learn more about Marketplace and who it is best designed for. Please Note: Within the conference agenda, there are numerous other opportunities to network – during the Pre-Adventures, the social events and meals, and more. As a delegate you have access to the networking mobile app and website, which allows you to start networking and booking appointments with delegates. Additionally, the sessions are full of information to help you improve your business. Lodging/Hotels – Jordan Tourism Board has secured several hotels at discounted rates for delegates. Flights/Airfare – Flights to and from Jordan are not included in the registration fee. Pre-Adventures – including transportation, adventure activity, equipment (if needed) and lunch. Available on first come, first served basis. Complimentary adventures are available to hosted delegates such as buyers, media and select VIPs. Adventures – what are they and should I attend? 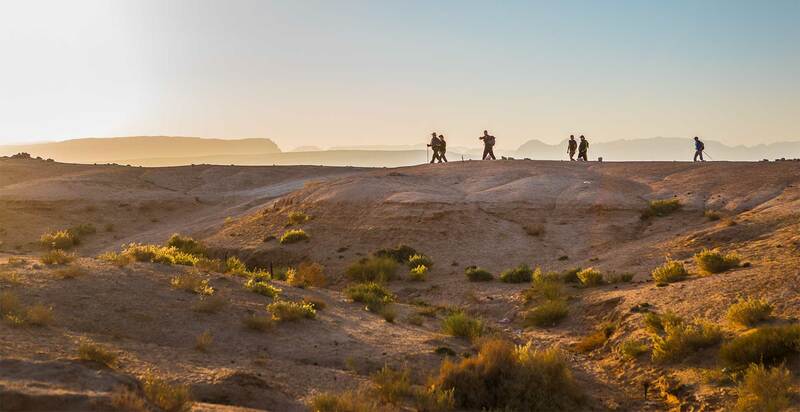 Pre- and Post-Adventures are 3-day to 7-day itineraries taking place in Jordan and partner destinations, designed to showcase the adventure tourism potential of the Near East region. Jordan Tourism Board encourages delegates to travel early to Jordan to experience and enjoy first-hand one of the incredible Pre-Adventures (PA) on offer. PAs are reserved for registered delegates (and paid guests) at a discounted rate provided by the tour operator (rates include accommodations, activities, and most meals through duration of PA. Specific inclusions and exclusions are noted in each itinerary PDF). International buyers, travel advisors, and media are eligible to apply for hosted attendance to AdventureNEXT Near East, which typically includes complimentary Pre-Adventures. If hosted, covered costs include accommodation (twin share; single rooms cannot be guaranteed), ground transportation during the PA, and select meals. Specifics of inclusions and exclusions are listed on each itinerary PDF. Hosted spots are specifically for international buyers and travel advisors seriously looking at Jordan as a possible future offering and those looking at expanding their existing program in the Near East. Media with a serious intent and ability to publish stories about Jordan will also be considered. If you would like to apply for a hosted buyer or media spot, please complete the appropriate application form. Please note that your application is subject to approval and availability. Buyers and media who are offered and accept one of these complimentary spots are required to participate in the Marketplace and may be interviewed afterwards about their experience. Applicants who are not approved for the hosted spots, as well as those delegates who are not buyers or media, are still invited and encouraged to join a PA at the discounted rate listed on the specific PA detail page. All paying participants must pay the PA tour provider directly. AdventureNEXT participants may transfer the financial value of their AdventureNEXT registration to a co-worker for no charge if written notification (to: [email protected]) is given 60 days before the event – unless specifically stated on registration materials. After that point, the transfer service fee is $125. If you are a hosted delegate, your hotel accommodations will be booked by our host destination. All other delegates, accommodation resources will become available in the coming weeks and provided via event updates. Please check back to the Traveler Information page or sign up for updates. Please check with your confirmed hotel for their cancellation policy. ATTA’s official air booking desk is Exito Travel. Registered delegates are eligible for Exito’s rates on flights to Jordan. Please check back to the Traveler Information page or sign up for updates. Are volunteer opportunities available for AdventureNEXT Near East? If you produce, publish, or sell a media product, we encourage you to attend AdventureNEXT as a regular delegate and immerse yourself in the regional adventure travel community while helping promote your company’s adventure product to the industry’s influencers and decision-makers. There are a limited number of official media delegate badges available for international freelance journalists, on-staff writers and editors, professional bloggers/influencers and broadcast journalists. Official media delegate badge holders are determined through an application process well in advance of the event. If you applied for a media badge but were not accepted, or if the media application window is now closed, you are also welcome to register as a regular event delegate (without media credentials). Local and regional media (radio, newspaper, television) seeking to attend may be eligible for a half-day media pass granting access to select sessions and/or events. To make your request, email Alaa Al-Hindi at [email protected] and include your press credentials with your inquiry. MARKETPLACE is a small, intimate environment that works to connect both suppliers and buyers. Similar to “speed dating” but with an emphasis on quality over quantity, your MARKETPLACE experience with be made up of up individual meetings with potential partners, and will provide a great atmosphere for introductions, learning about new opportunities and engaging in product development discussions. NOW: Register for the event and purchase a MARKETPLACE table. Please note that late registrations will have less access to scheduling appointments, so we encourage you to secure your table as soon as possible. End of March 2019: We will create a pre-matched schedule of appointments for you with Buyers & Media. You are welcome to add/change additional appointments once your schedule is received. April 2018: You will participate in multiple sessions of marketplace. Buyers and media will navigate the room and move to the appropriate supplier tables. Our ATTA Staff will guide you through the sessions and be on hand to help answer any questions you may have. *The registration fee does not include a marketplace table, this must be added in step three of the online registration process or by requesting an invoice. What’s included in the marketplace price? As a supplier, how can I secure high quality MARKETPLACE meetings? The AdventureNEXT app is step one to having a great Marketplace experience. Every registered supplier will have access to a supplier profile to showcase your company and offerings. Reaching out to buyers you wish to meet with prior to the Appointment Request process is step two – the more you reach out in advance the more meetings you will have on-site. Utilize the “Message” feature on the app to reach out to buyers and ask them to request you as requests will be approved based on Buyer – Supplier matches. I didn’t receive all my requested appointments, why? We do our best to provide as many requested appointments as possible but due to the popularity of certain delegates, full schedules and exact requests are not guaranteed. You are able to add or rearrange meetings after your schedule has been delivered through the app. *PLEASE do not contact ATTA to make changes or request appointments once your schedule has been delivered, it is your responsibility to make changes once your schedule has been delivered. Absolutely! Again, the AdventureNEXT app will be your best tool in making any change to your MARKETPLACE schedule. Your meetings will be uploaded to your profile in the “Meetings” section. You can add/cancel/change any meetings from this tab. Get breaking AdventureNEXT Near East News including newly added sessions and speakers, Adventures, Marketplace deadlines, and other timely news. ATTA cares about your privacy. See policy.